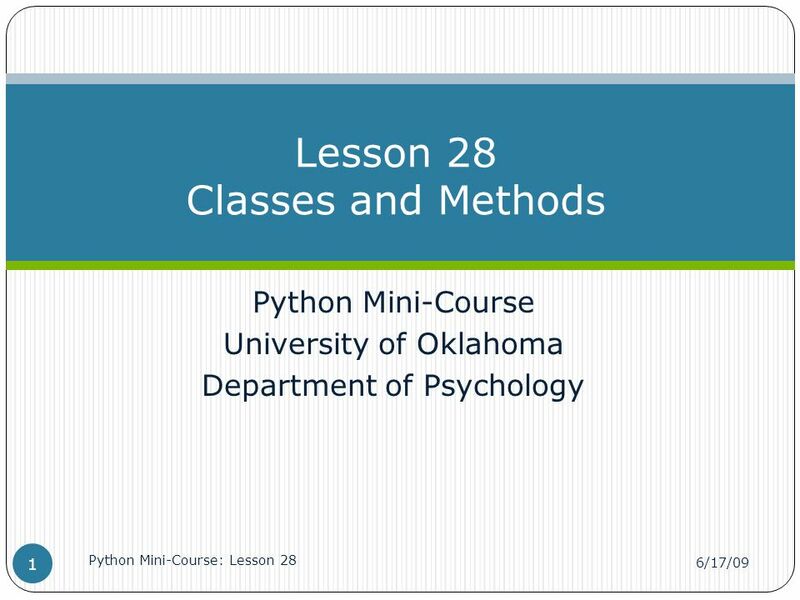 Python Mini-Course University of Oklahoma Department of Psychology Lesson 28 Classes and Methods 6/17/09 Python Mini-Course: Lesson 28 1. 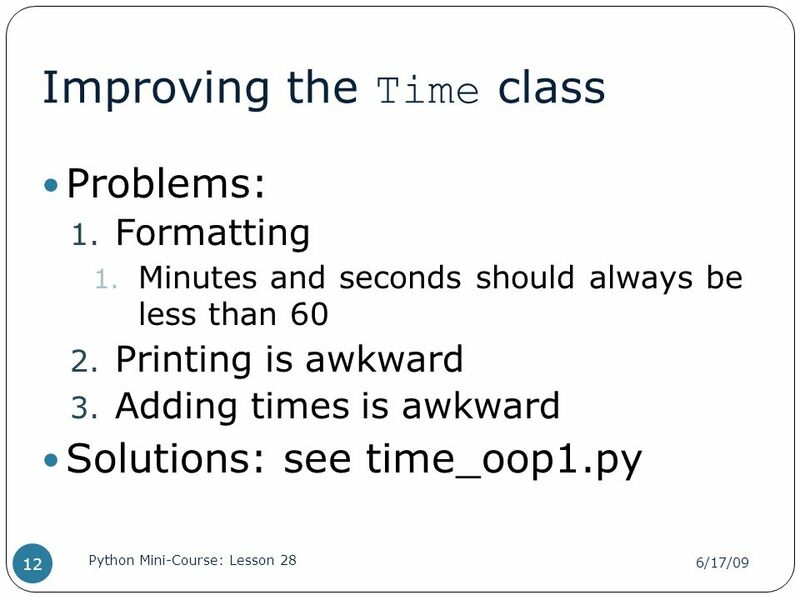 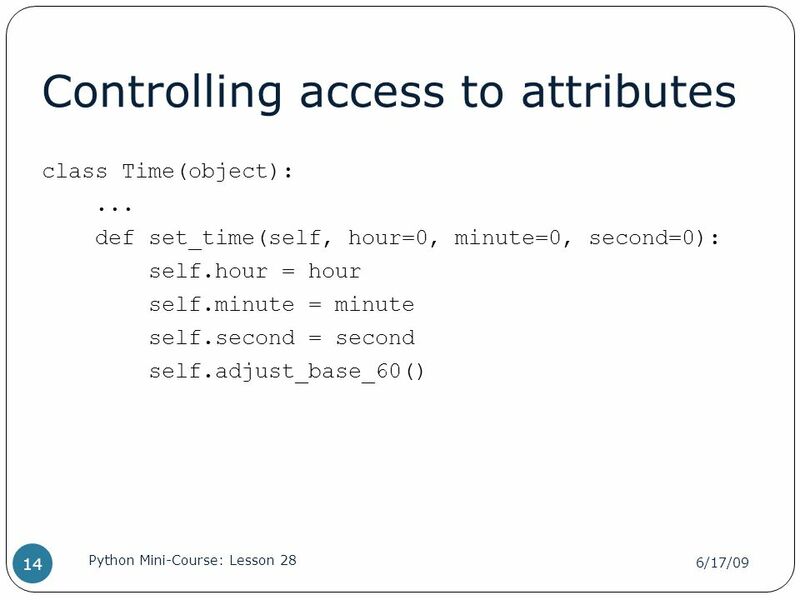 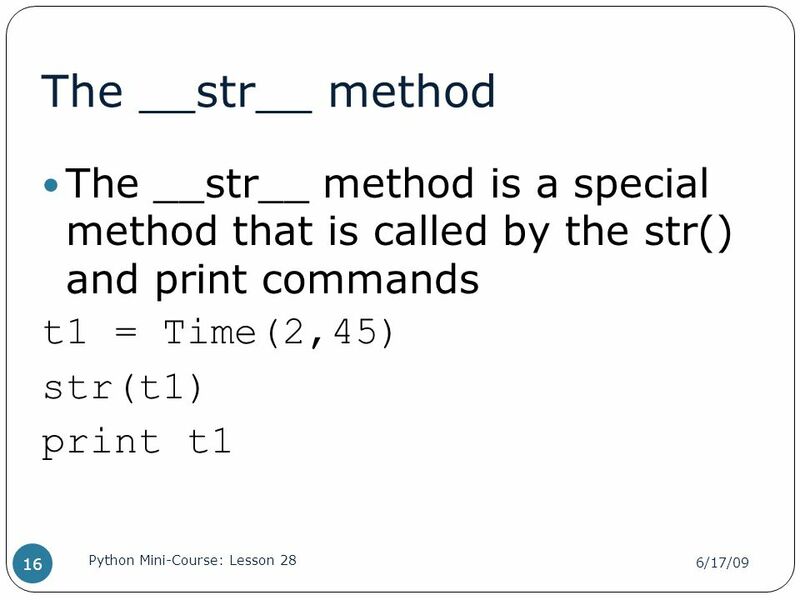 Download ppt "Python Mini-Course University of Oklahoma Department of Psychology Lesson 28 Classes and Methods 6/17/09 Python Mini-Course: Lesson 28 1." 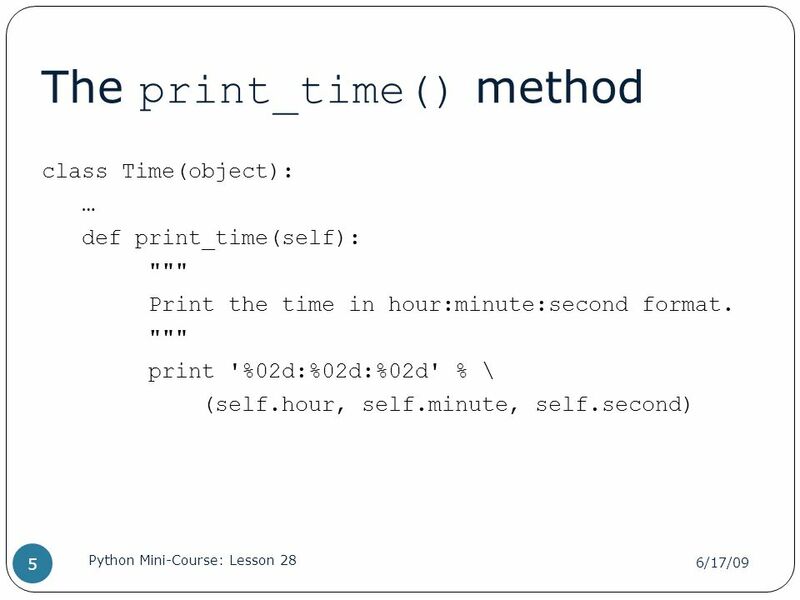 Exception Handling Genome 559. Review - classes 1) Class constructors - class myClass: def __init__(self, arg1, arg2): self.var1 = arg1 self.var2 = arg2. 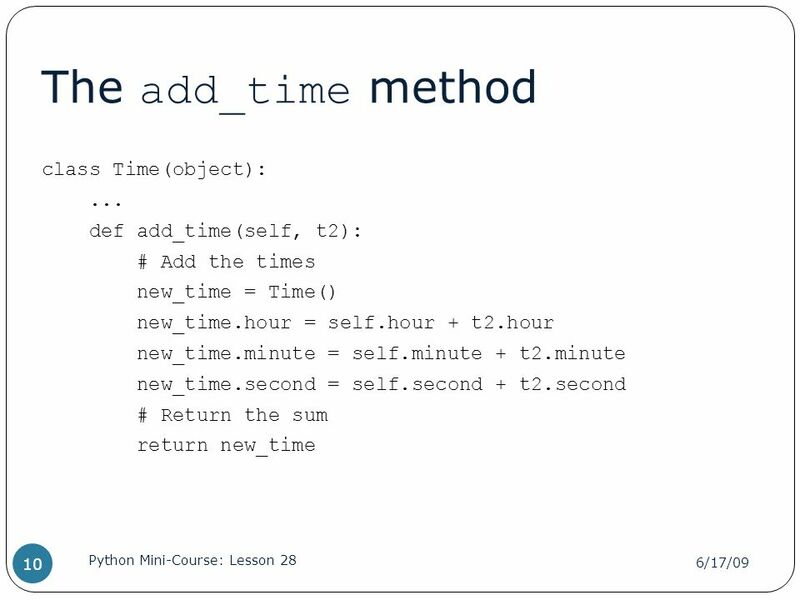 Python Programming Chapter 13: Classes and Functions Saad Bani Mohammad Department of Computer Science Al al-Bayt University 1 st 2011/2012. 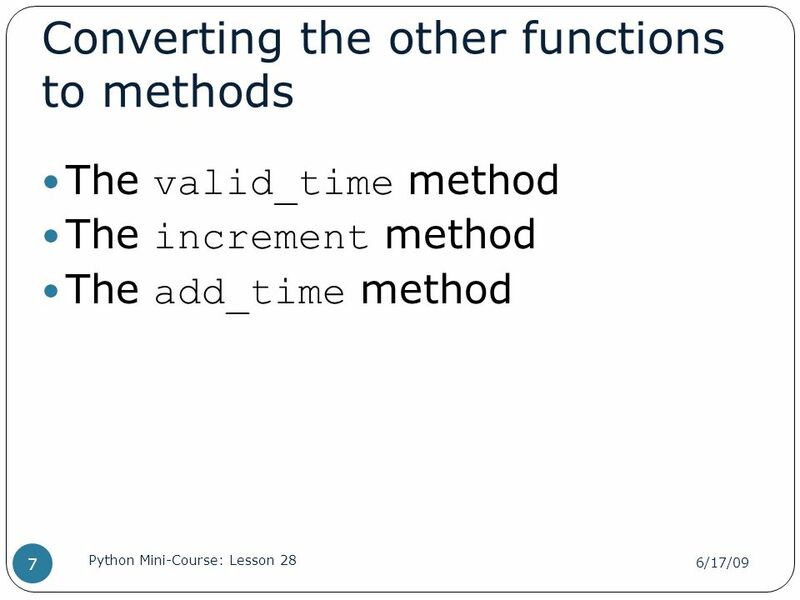 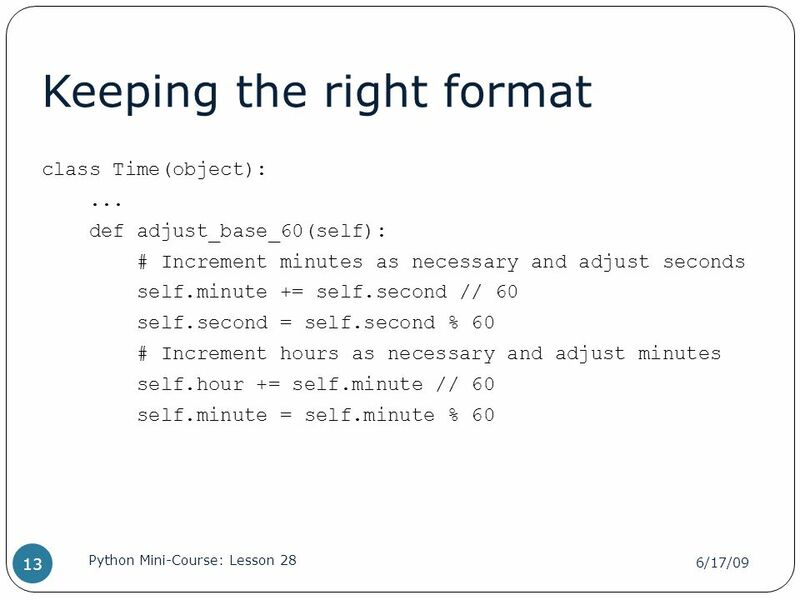 Python Mini-Course University of Oklahoma Department of Psychology Day 1 – Lesson 4 Beginning Functions 4/5/09 Python Mini-Course: Day 1 - Lesson 4 1. 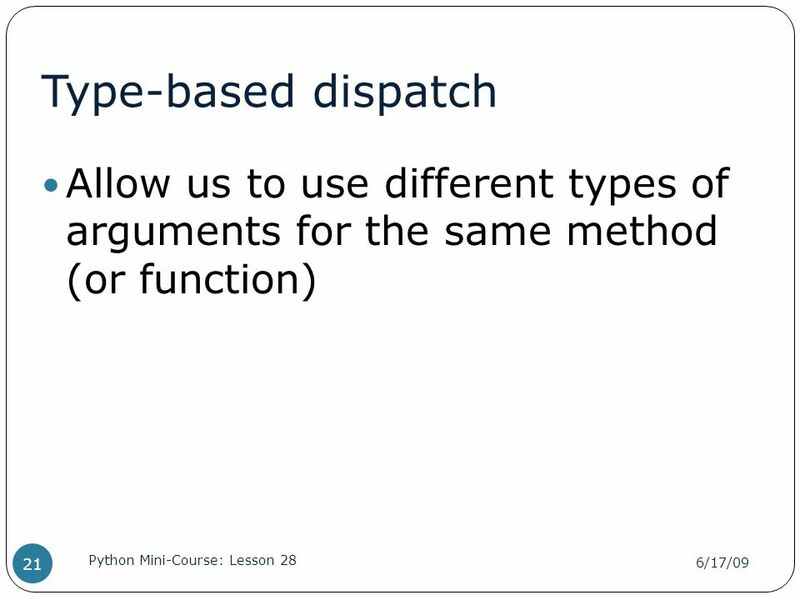 Lecture 04 – Classes. 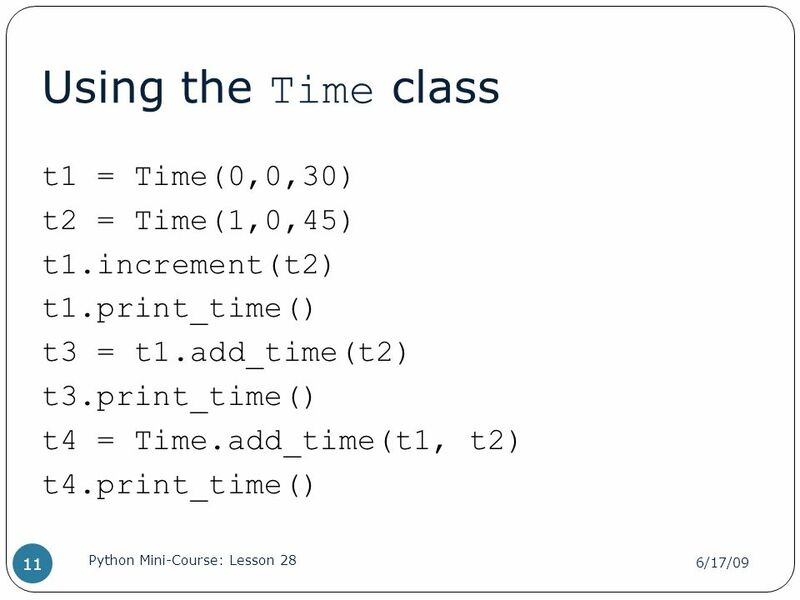  Python has a number of classes built-in  lists, dictionaries, sets, int, float, boolean, strings  We can define our own classes. 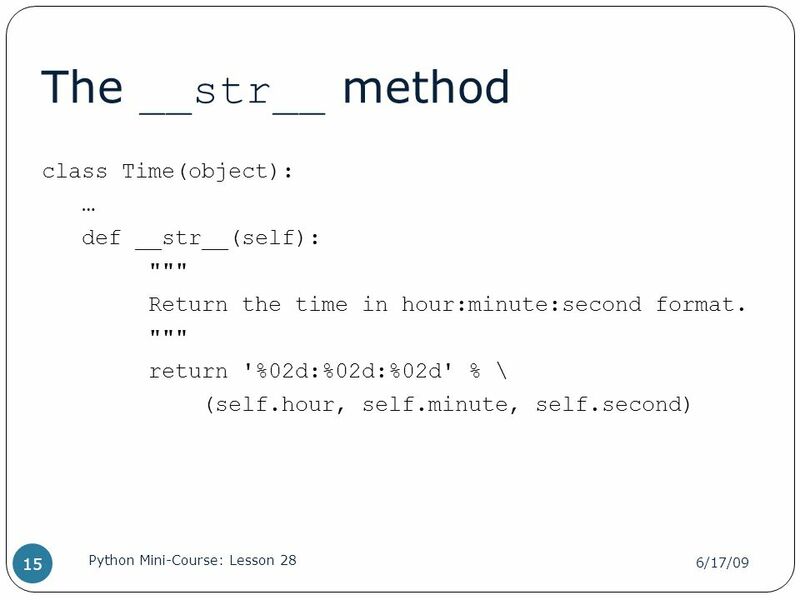 Object-Oriented Programming Python. 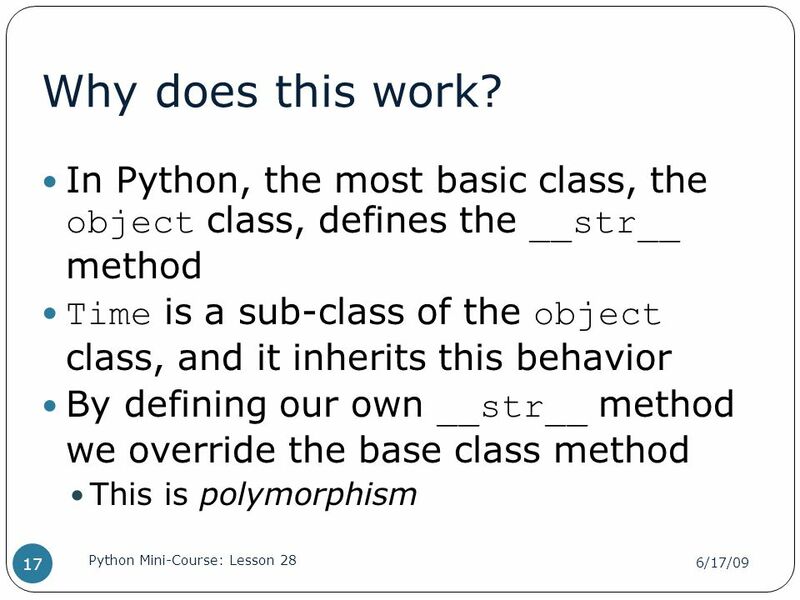 OO Paradigm - Review Three Characteristics of OO Languages –Inheritance It isn’t necessary to build every class from. 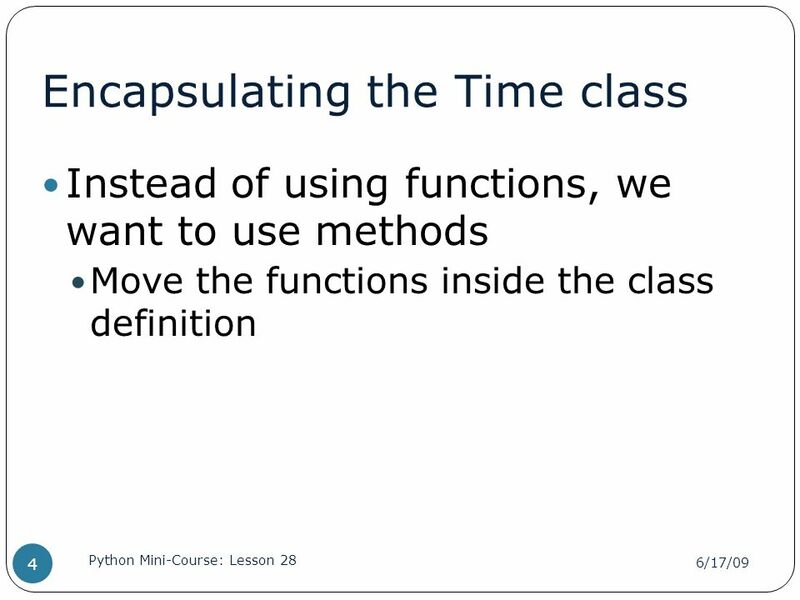 Python Mini-Course University of Oklahoma Department of Psychology Day 2 – Lesson 8 Fruitful Functions 05/02/09 Python Mini-Course: Day 2 - Lesson 8 1. 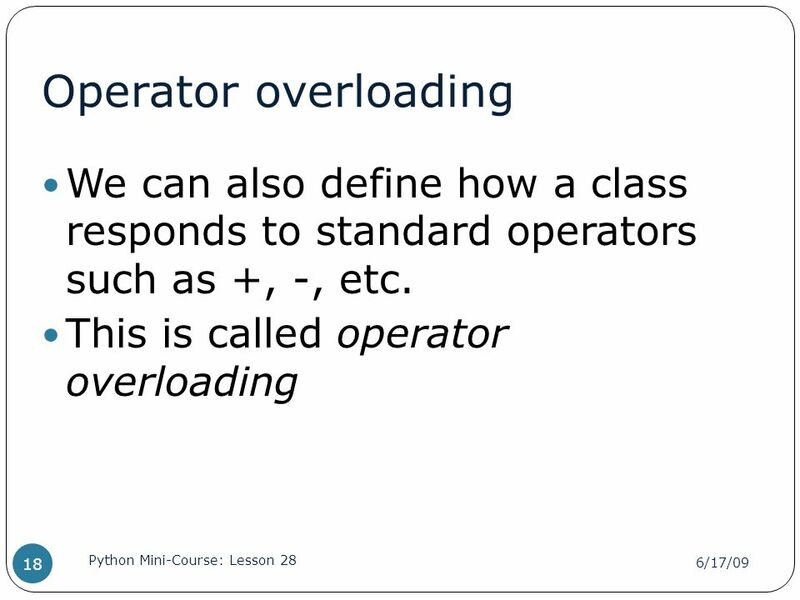 Chapter 1 Object-Oriented Concepts. 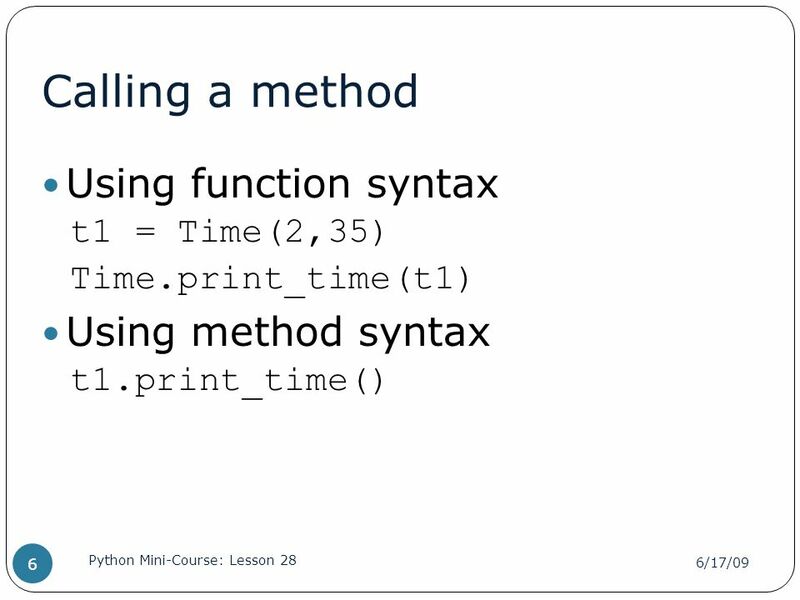 A class consists of variables called fields together with functions called methods that act on those fields. 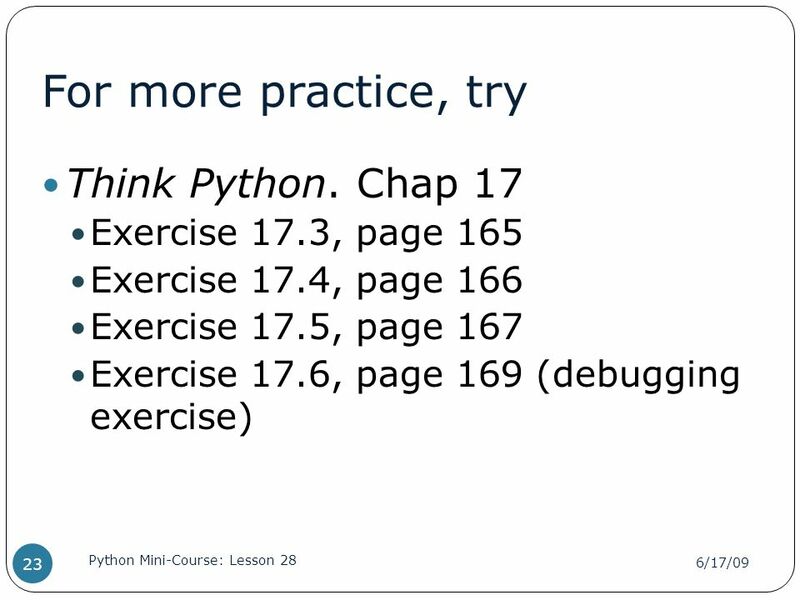 2/7/2008. 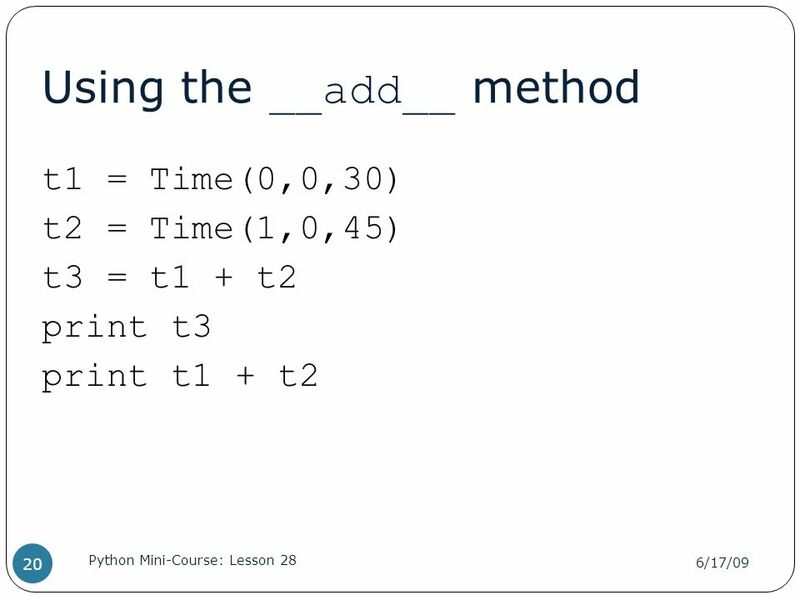 >>> Overview * boolean * while * random * tuples. 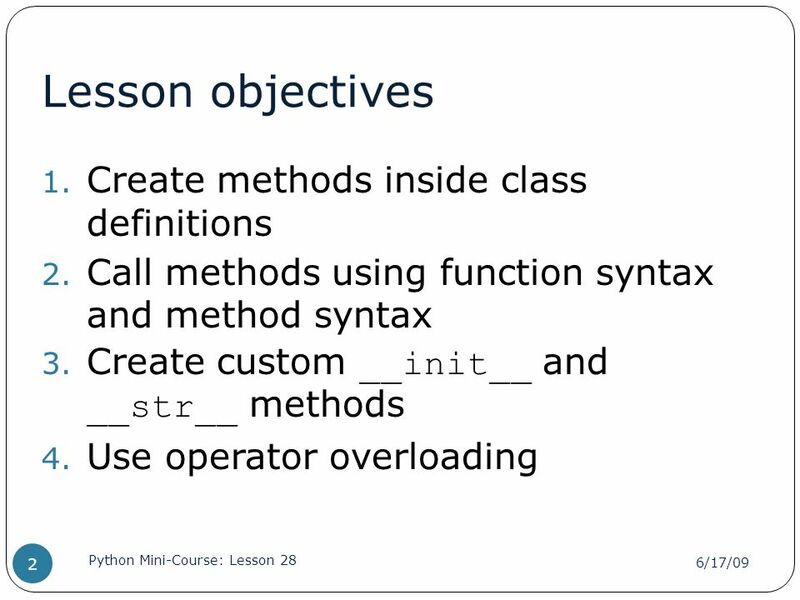 Python Mini-Course University of Oklahoma Department of Psychology Lesson 26 Classes and Objects 6/16/09 Python Mini-Course: Lesson 26 1. 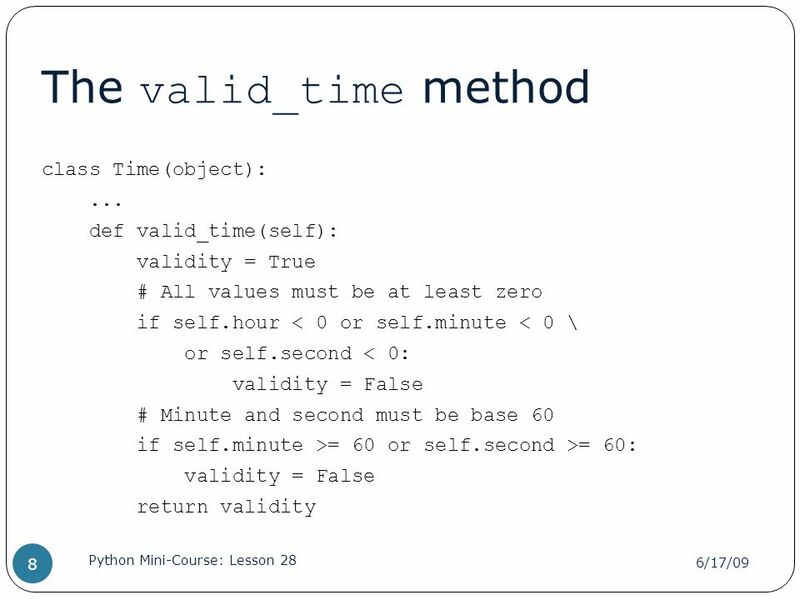 Python Mini-Course University of Oklahoma Department of Psychology Day 4 – Lesson 15 Tuples 5/02/09 Python Mini-Course: Day 4 – Lesson 15 1. 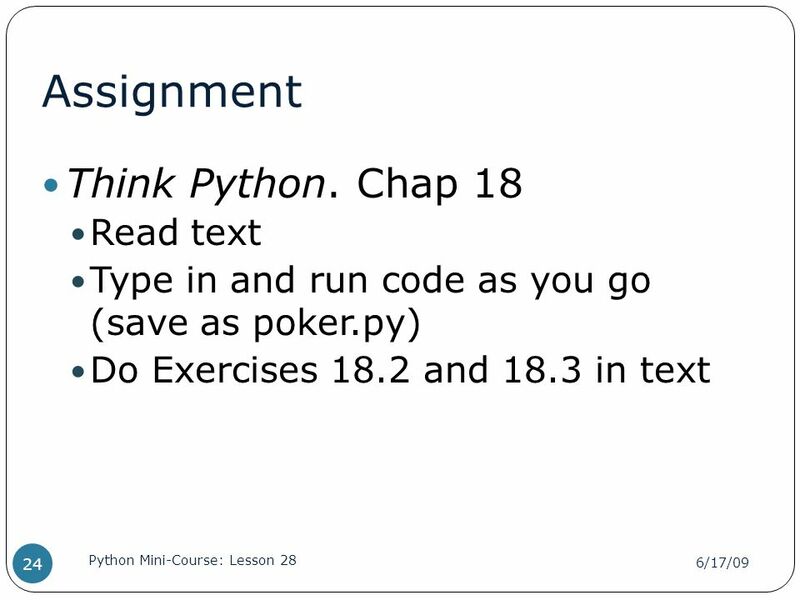 Classes 2 COMPSCI 105 SS 2015 Principles of Computer Science. 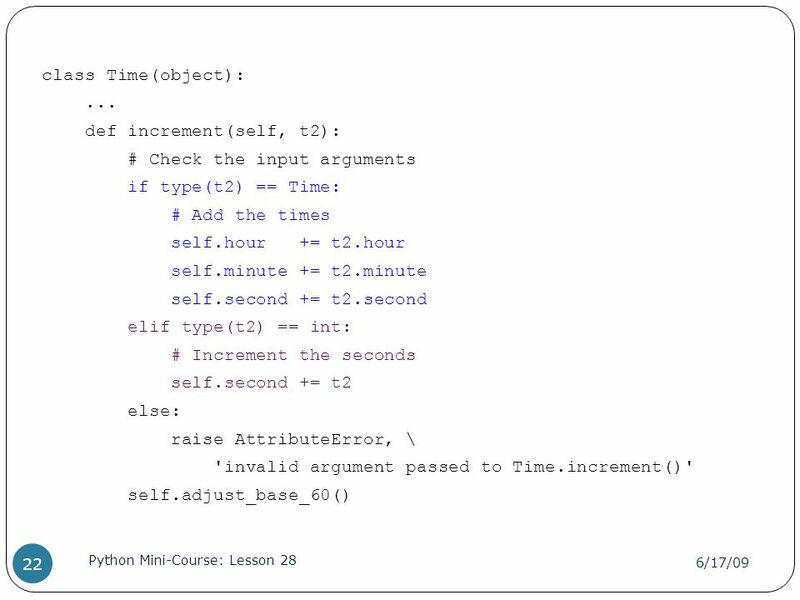 Recitation 6 Programming for Engineers in Python. 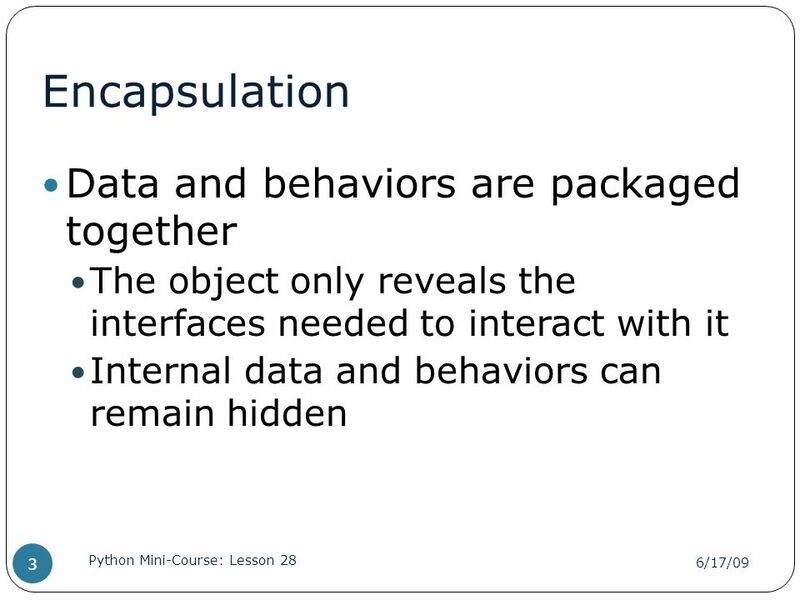 Python November 18, Unit 7. 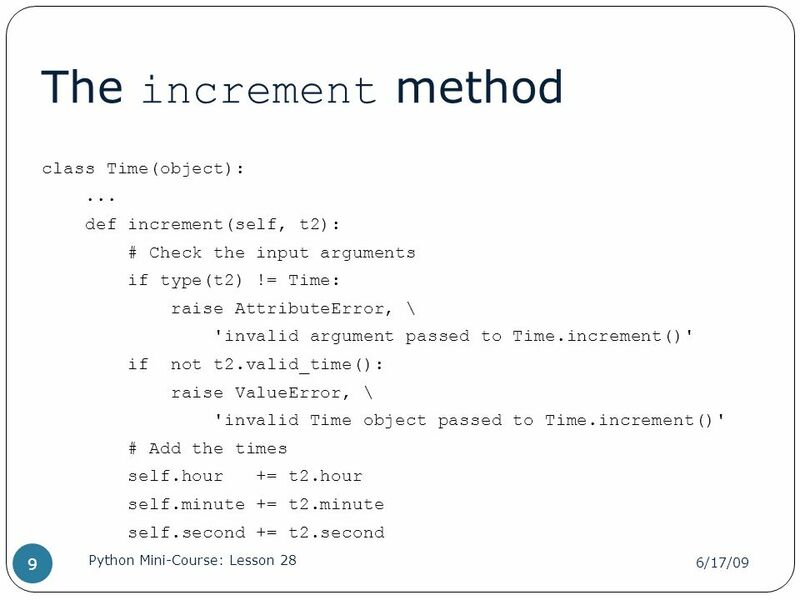 So Far We can get user input We can create variables We can convert values from one type to another using functions We can. 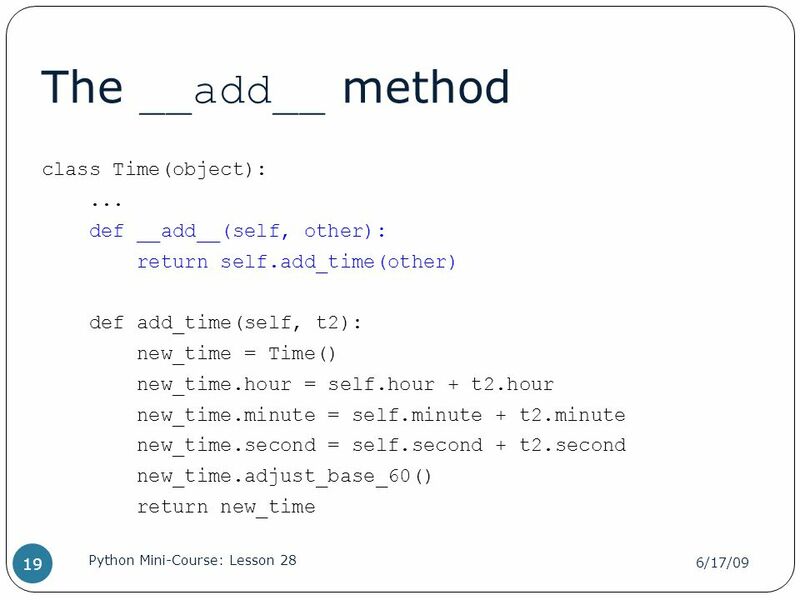 Overview The Basics – Python classes and objects Procedural vs OO Programming Entity modelling Operations / methods Program flow OOP Concepts and user-defined.